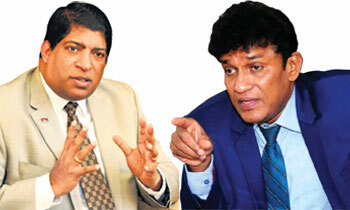 UNP MP Ravi Karunanayake yesterday denied the claims made by Tamil Progressive Alliance (TPA) leader Minister Mano Ganesan that underworld figures had been nominated for the upcoming local government (LG) elections to represent the Colombo North. Responding to a question raised by a journalist when MP Karunanayake visiting the grave site of slain newspaper editor Lasantha Wickrematunge, on his 9th death anniversary at the Borella Cemetery in Colombo, said, if 'members of underworld' can stay in the government what would be the problem. “I cordially invite all media personnel to visit Colombo North and to investigate over the claims made by Minister Mano Ganesan. We are walking freely but that minister is walking with special security,” he said. Earlier Minister Mano Ganesan requested President Maithripala Sirisena to provide him with Special Task Force (STF) security with a backup vehicle with five STF personnel to protect him from underworld threats. Mano Ganesan earlier said in a statement that he faced with serious security threats and sought the intervention of President, Prime Minister Ranil Wickremesinghe and had also written to the IGP in September last year. “MP Karunanayaka said people cannot do politics like ‘Re Daniel Dawal Migel’ or by engaging in religious extremism or highlighting racial issues". “UNP is the only political party which promotes the religious diversity in the country without any discrimination. We always maintain a common policy whether we were in government or in an election period,” he said. “We urge Minister Mano Ganesan to name the underworld figures if we have nominated such people for the LG election.We do politics in clean manner. The people who cannot obtain votes during the election making such claims and it was a habit to make such claims during the election period against UNP,” he added. YOU ARE EXACTLY CORRECT MANO, RAVI IS ALSO ONE OF THEM. Few months back and very recently there were shootings in this area! Yes, RK has removed all the underworld gangs from Col North and they are at his residence. Really can't understand why RK is so indispensable to Ranil with all rubbish that he's involved in. Unless there's reciprocation or Ranil stands to benefit. Being a minority MP and talking frankly against everybody whom he views differently if it is fully correct or wrong , may be in need of security .Ravi whose political career , which is seriously tarnished with his involvement in a national misdeed may try to ride on somebody else's back. Underworld figures may not have been nominated, but there are plenty of them who should be classified as such, in the very high ranks of the UNP. To enter Politics in Sri Lanka either you have to be a thug or should have the backing of underworld. That was the previous municipal elections. Hope it will never come to that level with the Kolonnawa incident and its the voters who have to see that such people are not nominated or elected. Mano is not a trustworthy person - he is playing someones else's agenda for profits to contribute to the coordinated attack on UNP leadership with fake cases, blames and plots.. assuming the general public can be taken on a cheap ride lol,. he needs security not from under world but from angry public coz he only have done lip service in past 5 or 10 years in politics,.